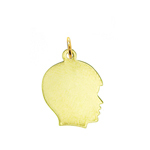 An endearing 14Kt Gold Girl Plate Charm is the perfect keepsake charm for your gold charm collection. 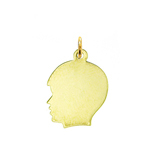 Superlative 14kt gold is impressively crafted into the silhouette of a young girl. 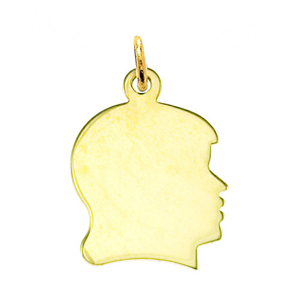 The smooth polished surface makes this 14Kt Gold Girl Plate Charm ideal for engraving. 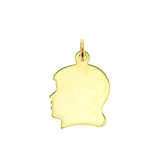 Pendant is crafted in 14k yellow gold featuring a polished finish with flat back, it measures approximately (18mm - 3/4") in width by (18mm - 3/4") in height and weighs 2.5 grams, it is recommended for necklaces.